Effective appellate advocacy requires experience and understanding of the distinct processes and workings of appellate courts. Winning an appeal draws on skills different from those needed at trial. Clients rely on us to analyze legal issues rigorously and creatively, write sophisticated, but readable, briefs and efficiently use the limited time at oral argument to persuade judges on the most critical points in dispute. Indicative of our expertise in this area, many of our appellate cases come to us through referrals from attorneys who handled the cases at the trial court level. We practice regularly before the Massachusetts Appeals Court, the Supreme Judicial Court, and the U.S. Court of Appeals for the First Circuit and other federal circuits. We have also represented clients and appeared before the U.S. Supreme Court. Our cases often involve novel issues of first impression and result in landmark cases or opinions clarifying previously unsettled issues of law. Todd & Weld lawyers have efficiently achieved favorable results for appellate clients across a diverse range of legal issues. Sindi v. El-Moslimany, --- F.3d --- (1st Cir. 2018). David Rich and Suzanne Elovecky persuaded the 1st U.S. Circuit of Appeals to uphold a defamation verdict for their client, Saudi Arabian scientist Hayat Sindi, who sued Samia El-Moslimany and her mother arising from numerous publications accusing Dr. Sindi of fabricating and exaggerating her academic credentials. Preston v. Nagel, 857 F.3d 1382 (Fed. Cir. 2017). The firm persuaded the Federal Circuit Court of Appeals to reject the defendants' argument that the America Invents Act overrides a bar to appellate review of remand orders from federal court to state court based on lack of subject matter jurisdiction. The court ruled that the defendants' patent counterclaims -- which the district court deemed non-justiciable before remanding the case to state court -- alone were insufficient to create an exception allowing the court to consider the remand order on appeal. Kiribati Seafood Co., LLC v. Dechert LLP, 478 Mass. 111 (2017). The firm persuaded the Supreme Judicial Court to overturn summary judgment for a law firm and grant summary judgment to its client which had sued for legal malpractice. The SJC for the first time ruled that judicial error of law does not bar recovery in a legal malpractice case where a defendant law firm was negligent for failing to prevent or mitigate the legal error. In Re: The Honorable Leon A. Kendall, 712 F.3d 841 (3rd Cir 2013), in which Todd & Weld's argument on behalf of its client, Hon. Leon A. Kendall, resulted in the issuance of a landmark decision ruling that the First Amendment protects sitting judges from being criminally punished for their opinions. Chambers v. Gold Medal Bakery, Inc., 464 Mass. 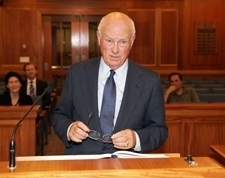 383 (2013), in which Todd & Weld argued on behalf of the plaintiffs, who are 50% shareholders and two of four directors of a closely-held corporation, with the result that SJC remanded the request for the production of documents so that the lower court can parse more finely the plaintiffs' production demands. Robert Somers v. Converged Access, Inc.,et al, 454 Mass. 582 (2009), in which Todd & Weld represented the company in a case of first impression on potential defense to misclassification under independent contractor statute, M.G.L. c. 149, Sec. 148B, and successfully defended company in claim of age discrimination. Demoulas v. Demoulas Super Markets, Inc., et al, 18 Mass. L. Rptr. No. 6, 130 (Aug. 23, 2004) (aff'd 66 Mass. App. Ct.) in which Todd & Weld successfully represented one of the defendants on the Board of Directors of Demoulas Super Markets, Inc. when the Massachusetts Appeals Court affirmed the trial court's judgment dismissing the plaintiff's amended complaint in a corporate governance lawsuit. Subaru of New England, Inc. v. George Lussier Enters, 393 F.3d 36 (1st Cir. 2004), in which Todd & Weld successfully defended a summary judgment terminating a major class action. Anastos v. Sable, 443 Mass. 146 (2004), a case in which the Supreme Judicial Court affirmed a substantial verdict in our client's favor and which resolved novel issues relating to the allocation of partnership assets at dissolution. Zoning Bd. Of Appeals of Wellesley v. Ardmore Apartments LP, 436 Mass. 811 (2002), in which Todd & Weld submitted a friend of the court brief on behalf of its client, the Massachusetts Housing Finance Agency, which resulted in the Supreme Judicial Court substantially accepting the Agency’s position on an important issue related to the preservation of affordable housing in the Commonwealth. Matter of F. Lee Bailey, 439 Mass. 134 (2002), one of the many professional discipline cases in which we have represented attorneys or other professionals before licensing boards and, ultimately, on appeal. Bradstreet v. United States, 207 F.3d 76 (1st Cir. 2000), where we successfully defended a significant downward departure from federal sentencing guidelines which we had obtained for the accused in the district court. Greater Franklin Developers Assn. v. Town of Franklin, 49 Mass. App. Ct. 500 (2000), in which Todd & Weld represented developers who successfully set aside certain impact fees as an unlawful use of the taxing authority. E.N.O. v. L.M.M., 429 Mass. 824 (1999), (a widely-cited case which has been influential across the nation) in which we represented a biological mother in a case defining the rights of de facto parents in alternative family settings. R.R. v. M.H., 426 Mass. 501 (1998), in which Todd & Weld represented the biological mother in a case defining the enforceability of surrogate parenting agreements in Massachusetts. Rizika v. Donovan, 45 Mass. App. Ct. 159 (1998), in which we successfully restored a multi-million dollar jury verdict which the trial court had erroneously set aside. In re Reorganization of Elec. Mut. Liab. Ins. Co., 425 Mass. 419 (1997), further proceedings at 426 Mass. 1007 (1998) and 429 Mass. 795 (1999), a case in which we represented an insurance company in connection with its reorganization. First Enterprises v. Cooper, 425 Mass. 344 (1997), a case which resolved an issue of first impression in the Commonwealth concerning the potential scope of an attorney's liability to non-clients. Palmacci v. Umpierrez (In re Umpierrez), 121 F.3d 781 (1st Cir. 1997), a case which helped define the parameters of common law fraud and a non-dischargeable debt in this Circuit under the Bankruptcy Code. Pettingell v. Morrison, Mahoney & Miller, 426 Mass. 253 (1997), a nationally recognized case circumscribing the restrictions which a law firm can place upon a departing lawyer's ability to practice law. Stark v. Advanced Magnetics, Inc., 79 F.3d 1165 (Fed. Cir. 1996), further proceedings at 119 F.3d 1551 (Fed. Cir. 1997), an intellectual property case clarifying inventorship issues and patent applications. "Brief Writing in the SJC and Appeals Court"